I’m home. It’s strange to think that the two-week journey of tropical field biology has already ended. 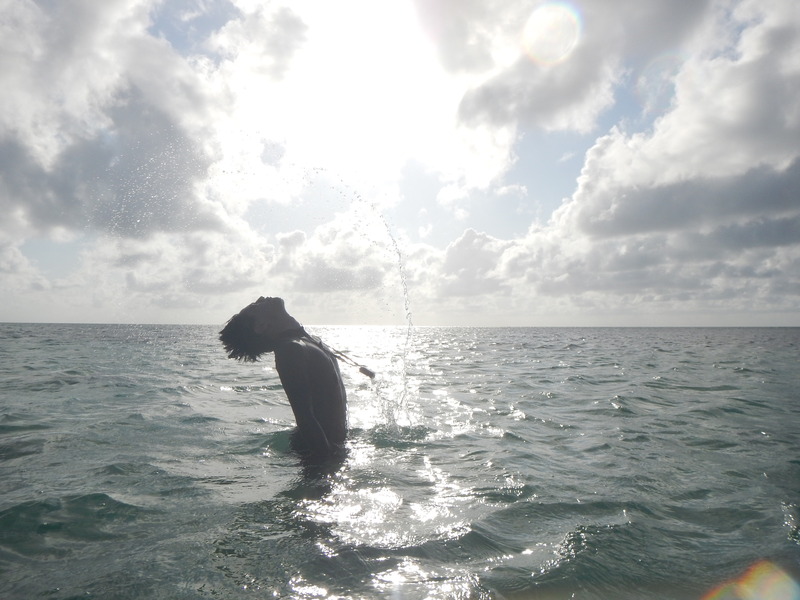 I feel that being in the Chiquibul forest and Glover’s reef has not only informed me knowledge wise about these two diverse ecosystems, but it has also changed me spiritually. One thing I can’t help but see is how similar the Chiquibul and Glover’s are. Don’t get me wrong, they harbor completely different life forms and habitats, but both have incredible species specialization. 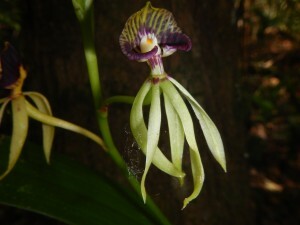 Each organism on both places occupies a unique niche where they thrive in the competition for resources and reproduction. Just as some species are suited for the deeper reefs, other terrestrial creatures live their lives high in the forest canopy. The many possible ways life forms can occupy an available niche gives the opportunity for speciation, and with time and enough resources, a divers array of species can emerge. Species diversity also depends on the amount of free resources in a given area. Surprisingly, both the reefs and the forests in Belize are low in nutrients, yet both areas have developed adaptations to ensure high efficiency of nutrient cycling. Organic matter in both places is quickly recycled into nutrients that sustain the reef and forest food chains. To me, the stars of the nutrient recycling goes to the detritivores of both the forest and the sea that turn dead material into accessible nutrients for primary producers like plants and algae. Symbiosis is a common theme between forests and reefs. For example, corals depend on symbiotic algae that photosynthesize nutrients to the coral polyps, which provide housing and protection to the algae. In forests, acacia trees and ants share a symbiosis where the ants live within the tree and feed on protein buds provided by the leaves while tree gains protection from herbivores with its ant army. One critical difference I’ve observed is how people talk about recovery and resilience for forests versus recovery for coral reefs. Even though both ecosystems are sensitive to changes, reefs can completely die out with only 2 degrees Celsius of change, something that affect the forests as much. The prospect of rising sea levels, temperatures, and human development seems to put more pressure on the reefs than on the forests. I often find the tone of forest conservation in the Chiquibul to be more optimistic than similar conversations in Glovers. This course is nothing like I expected it to be. I never imagined being so excited to hear someone yelling ROACH from their restroom. My favorite parts of the course were the night walks and diversity dives which allowed for me to search for my taxa and learn about them and their ecology. I also enjoyed the guest lectures as they were very informative on either conservation efforts at belize, or simply giving a profound look into the tropical field biologist life. The least enjoyable part of the course was the crummy transportation organization, but I guess accidents happen! Other than that, I think it’d be a better idea to give lectures earlier on in the day than late at night, when it becomes difficult to stay awake. Plus giving taxon briefings earlier on would give each of us an idea of what to look for. While I learned a lot of interesting nature facts, conservation efforts, and natural history of belize, I think the biggest growth I had here in Belize was spiritually. When I heard Lauren’s talk about the difficulties of managing camera traps in the Chiquibul and all the things that went wrong in her studies, I was amazed to see her bright personality still shine through. Her words “Don’t take life too seriously” made me reevaluate my priorities. To move on easily in life in the midst of failure and not freak out is a skill not many have and to see it manifest in a field biologist really left its mark. It’s definitely a new mantra I need in my life! As the roach expert, I think the course has changed how I see cockroaches in my life. By forcing me to read on a “despicable” creature, I was given an opportunity to get out of my comfort zone and learn the true diversity of these creatures outside of stereotypical portrayals. I learned that cockroaches are a super diverse family of insects that come in all sorts of shapes, colors, and sizes, each adapted to a particular niche of its environment. I think it’s been particularly exciting to study a family that not many people are willing to look at. Each day, I learned about and saw new species with unique patterns and behaviors. A final impactful point that has changed me is the beach cleanup project and marine debris lecture. I never expected such a pristine location to feel the effects of marine trash. The more I cleaned, the more sever I felt the problem become. I couldn’t help but feel convicted with guilt as I saw all the brittle plastics being sorted out of the island. It really made me see the urgency of action in a very relevant setting. The experience was nothing short of eye opening. I hope it’s something I can continue on my own and hopefully get more people involved. 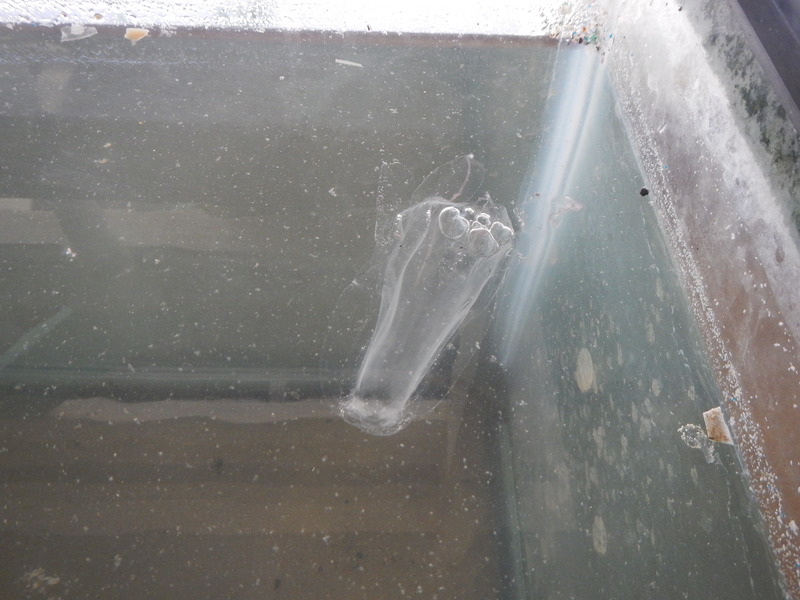 Just when I thought my efforts were futile in finding the elusive jellyfish and ctenophores around Glovers, this afternoon my colleagues managed to find for me six box jellyfish wash up on shore! And as a bonus, the whole group was preparing for a taxon group exhibition where we have specimens to display and explain to each other. I was able to harvest the 6 jellyfish, being wary to not touch the notoriously venomous tentacles. In most cases, handling a box jellyfish by the head (bell) is harmless, though some species are known to contain stinging cells on their head, but those variants only occur in parts of Australia. The species of box jellyfish found was Alatina alata, the same as the jellyfish first found. Their stings are known to cause something called Irukandji syndrome, a life threatening condition that manifests in symptoms like headache, body pains, vomiting, a sense of impending doom, and hypertension. Pretty scary. A scary fact about jellyfishes is that even though most of the specimens were dead they could still sting. During my presentation, a large sign hung over me saying, DO NOT TOUCH! I hope I didn’t worry my instructors too much! Beached Alatina alata sample in a fish tank. Beware of sting! Would you be able to spot this dangerous creature in the water? Even though these guys were scary to handle, I had so much fun looking at these dangerous creatures close up. I was able to show my class the tiny complex eyespots embedded in the jellyfish. One question I have is why these 6 jellyfish all beached at Glovers at the same time? Were they traveling as a group or was it just coincident beaching? If they were traveling as a group, are jellyfish capable of social behaviors? Questions abound, but this has definitely been an exciting turnaround in my jellyfish adventures. One thing I should point out, box jellyfish aren’t in the same class as “true” jellyfish. They have different complexities of their nervous systems in spite of sharing a similar body plan. Let’s see if I can find anymore jellyfishes on our trip to the mangroves this next morning! Other than the amazing box jellyfish beaching, we dissected some lionfish that we captured a day before to analyze their health and stomach contents. Lionfish are invasive species and eat basically anything, so our info may shed light into how these guys are doing in the Caribbean. Once we finished dissection, we made ceviche out of them! Delicious science and an interesting way to end our last full day at Glover’s. 2016Box jellyfishCtenophores and jellies?last daySam GaoStung! The life of a TFB must be tough. I’m always hearing news of how this ecosystem has fallen to invasive species, or how this reef has had 90% mortality in the past year. Today, we cleaned up a short segment of beach of any trash we could find and quantifying our findings into useful data for future reference. But during collection, we all couldn’t expect the sheer volume and weight such a job carries. It’s like fighting a losing battle, because when you dig up a handful of plastics, you only find more before you. As a fourteen-man team, we collected a total of about 40 kg of trash, mostly in plastics and Styrofoam in just an hour. 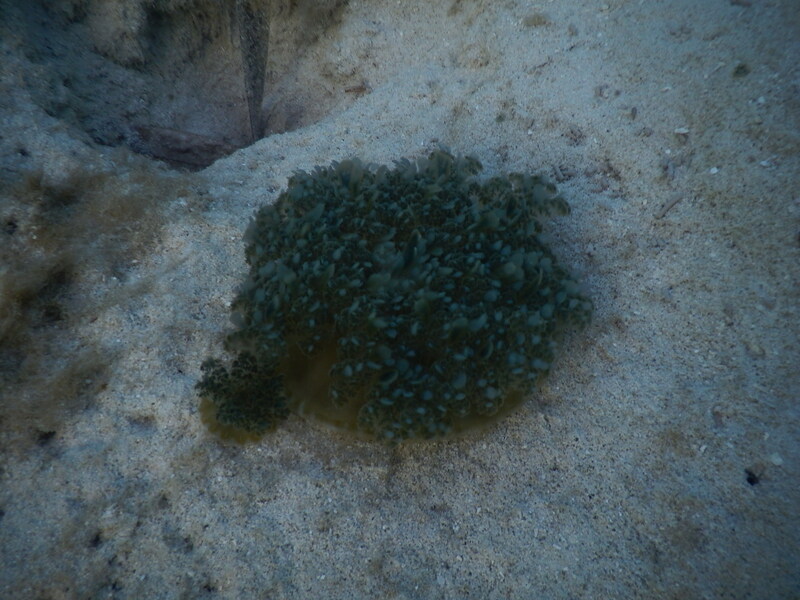 Our other task was to quantify the percent area of living corals in an assigned patch reef from last year, and the results only show insignificant live coral cover and significant numbers of dead coral. It’s easy to get emotions down at times like this, given the first world comforts we’ve sacrificed. I wonder how other biologists, especially those that work in conservation, find hope and keep their heads up in what they do. No new jellyfish were spotted today, other than the same upside down Cassiopea jellies. I’m starting to wonder if they even occur in the environments of an atoll regularly, and to be honest, it’s a bit frustrating. But I have hopes that our last day tomorrow will give rise to something interesting. I think I’m beginning to realize why people are so obsessed and interested on corals, which on the outside look like colorful pieces of rock. Not only are these rocks filled with living polyps, but they also are sensitive to changes to things like temperature, depth, light, and ocean salinity. One thing I saw was how the composition of corals changes dramatically with a few feet of depth change along a gradual slope on our deep-sea dive to the fore-reef. Towards the shallows, you find aerodynamic, small, floppy corals that can stand the power of the waves, while the deeper corals are larger in magnitude, forming magnificent mounds. We took a second dive in a shallow reef bed called the back reef, where in just four feet of water you can find an incredible diversity of animals and plants, ranging anywhere from coral polyps, to anemones, to stunning reef fishes, to lionfishes, to giant stingrays, to giant barracudas. This incredible diversity is due to the placement of this reef in Glover’s Atoll. Think of an atoll as a ring of corals with wind blowing on one side of it. 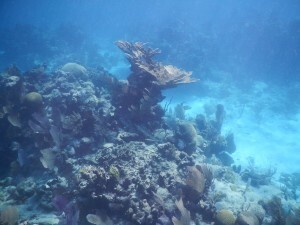 Depending on the orientation with respect to the wind, you can get completely different colonies of coral reefs with different compositions and abundances of other creatures. Unfortunately, even after going through two extremes of reefs, I couldn’t find even one jellyfish or jellylike creature. I’m wondering what about the rich nature of the reefs makes jellyfish life so difficult. Jellyfish tend to proliferate in areas of high nutrients. If what my colleague’s lecture on nutrient cycling on the reefs is correct, then the lack of available nutrients in a diverse ecosystem like a coral reefs would prevent growth of jellyfish in the area. So far, the jellyfish I’ve spotted where either photosynthetic jellies like the Cassiopea species that lived in the shallows near the mangroves, or by accident like the mangled box jellyfish. Well, either way, I’ve got some neat shots of things outside of my taxon group, and I hope you enjoy them when I upload them! Today was another activity filled day of snorkel work using our quadrants to evaluate density of corals in two different areas as well as finding sea urchins as a proxy of coral density. While not directly related to each other, differing ratios of coral to algae ratio can affect urchin diversity and abundance. One cool thing to know about sea urchins is that they feed primarily on algae that compete with corals. In a way, the urchins keep the algae from taking over the coral spaces. The data obtained from this project could give us a clue as to how these reefs are doing, given their tragic demise these recent years. During our search, I encountered 2 little jelly blobs that were virtually transparent in the water. The only way to see them was to see how the light was bent differently due to passing through a jelly medium. These guys were about the size of a golf ball and looked quite fragile. I wonder if they were the ctenophores I am looking for. Ctenophores are also known as comb jellies referencing their comb like cilia hairs that they use to swim through the waters. Comb jellies actually aren’t jellyfish in the true sense. Genetically, their more related to sponges than to true jellyfish. They also have a fundamentally different body structure than jellyfish, having a lobed appearance and no stinging tentacles. I couldn’t see if these little jelly blobs were actually ctenophores. This makes me wonder about the frustration of professionals who study these jellies. Other than those two jellies, I went back this evening to snap some photos of those upside down jellies from a few days ago. Based on the images, I can say with confidence that they are Cassiopea frondosa. A similar upside down jellyfish, C. xamachana, has leaf-like projections sticking from its tentacles, which picture doesn’t show. It takes time to build trust with a person you’ve just met. In a similar way, we TFBs need time to adjust from the forest into the surf. I’m learning that the insects at the ocean are much more bloodthirsty than those in the dry forest. We also practiced some diving research methods, most notably using hand-made quadrants to measure density and abundance of certain kinds of green algae. Navigation through water, as well as diving well took a lot of effort and many problems were encountered. In a way, I feel like a stranger in a paradise setting, unaware of how to cope with the surroundings around me. Glover’s reef is one of the prime pristine locations of the world, with a great amount of biodiversity. Yet today, I realized that this paradise has some caveats. 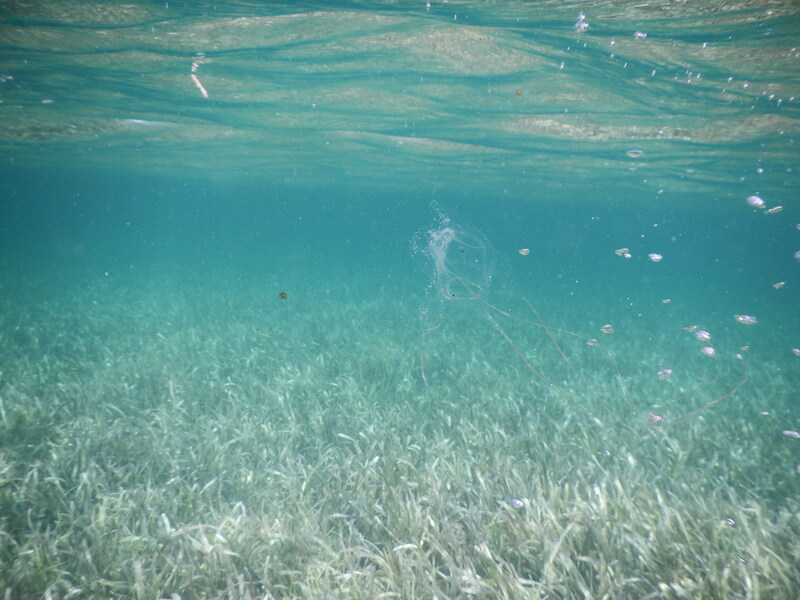 During a dive, I located a mangled box jellyfish (Cubuzoa, species: Alatina alata) swimming near the sea grasses. Box jellyfish are some of the most complex jelly-like creatures out there, not only due to their unique shape, but also to their notoriously strong stings and their advanced invertebrate nervous system that allows for complex visual tasks. In the picture I took, you may be able to notice small brown dots in the jellyfish, that may resemble pieces of sand but are actually its eyes. 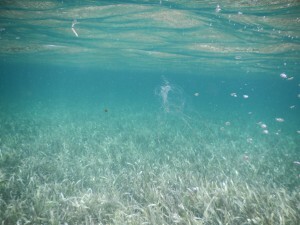 Can you find the venomous box jellyfish in my photograph? Can you also find it’s eyes? Box jellyfish aren’t really commonly seen in Glover’s reef, and those that do make it to shore are often torn apart by the currents and sharp corals that surround the atoll. But this sighting is cool but firm reminder for all of us to be careful of the things around us. Jellyfish don’t seem too common by the Middle Caye, the island that we are residing. 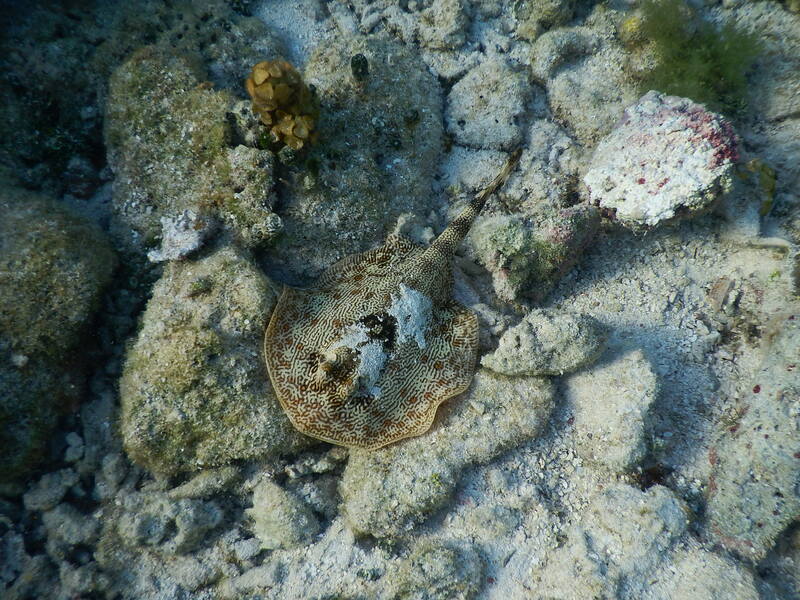 Perhaps, tomorrow’s boat ride out to deeper reefs will yield waters with these phenomenal creatures. P.S. : I found a special stranger joining me on this paradise. Wish it luck on this isolated place and hope it can send postcards to the forest! Say hello to my old friend, the Glover’s reef roach! At this point, I’m having an identity crisis of sorts. 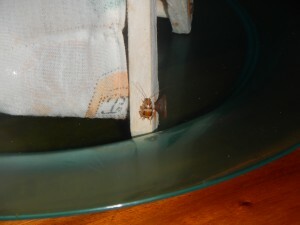 Even though I’ve officially left the forest, I still feel compelled to find and analyze any cockroach that I find. While doing the ocean portion of the course, I am to look out for ctenophores and other jellyfishes, which I will explain more as the days keep going. Today, we did a first dive from the boat dock near the Middle Caye (the island we will be residing in). During the dive, I managed to find the notorious upside down jellyfishes (Cassiopea sp.) resting on the bottom of the sand. Their notoriety comes from their abundant numbers and annoying stings. As their name implies, these jellyfish prefer to orient themselves with tentacles facing up and bell facing down. This orientation is due to the photosynthetic symbionts that rest within the tentacles and require sunlight. The jellyfish protects them by surrounding with a mat of stinging tentacles and is fed the photosynthetic products from its buddies. Hopefully, we will be able to protect ourselves. Cassiopea xamachana. A young jellyfish and a larger one next to it. 2016cockroachesCtenophores and jellies?Sam GaoTFB or Tourist? Today, I left my forest haven. It’s certainly been a wild ride with my cockroach buddies, witnessing firsthand the cockroach species of Belize. While I didn’t mean the farewell to be sentimental, sometimes nature has its own plans. As I prepared to pack my belongings onto the (very late) bus, I noticed a small cockroach that I had identified previously in my records running across the open clearing towards me. This was strange to me, as it was the middle of the day, and the roach was terribly exposed in the open field. It seemed in a bit of a hurry, so I let it keep on with its business. However, deep inside me, I almost felt a sentimental connection with the roach, bidding it farewell as I drove in the class bus to our new lodgings in preparation for Glover’s Reef. 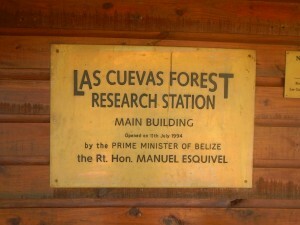 We drove from Las Cuevas and stopped at the Belize Zoo Lodge after a few hours of finagling with a mixed up bus schedule. 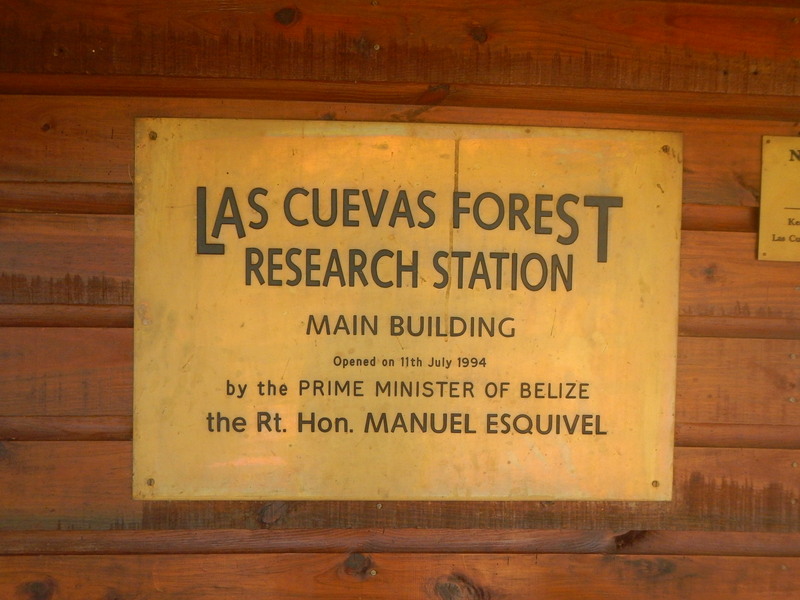 At the zoo, we had the opportunity to see up close the mammals that inhabited the forest surrounding the Las Cuevas research station (the Chiquibul forest). The zoo staff showed the various big cats like jaguars, ocelots, and pumas and shared the backstories behind how the zoo obtained these beautiful felines. Many of the creatures from the zoo were rescued by the forestry departments, either from neglectful pet owners or simply weaker individuals from the wild. While today felt more like a luxury visit, complete with ice cold drinks and gift shops, I needed to remind myself that the tropical field biologist adventure is still ongoing. 2016cockroachesCtenophores and jellies?Sam Gaosee metfbWhere do i come from?Where will I be going?Who am I? It’s strange to think that our first half of the class is already over. We’ve wrapped our camera trap project by seeing some spectacular mammals of the Belize forest like the strange tapir. I think as a team, we’ve come out of these projects as something like buddies, always watching out for each other and informing anyone if an interesting species was ever encountered. In terms of cockroaches, not many were encountered, due to the fast paced nature of the final wrap up day. However, I must say that being in Belize for this past week and photographing, witnessing, and teaching on the cockroaches of Belize has taught me the importance of studying these misunderstood insects. Belizean roaches are very understudied, and studying these guys has given me novel information on the variety of roach species in the area as well as some insights into their behavior, from nymph behaviors to escape/defense mechanisms. While I doubt that I will be able to contribute something significant to the scientific roach community with my pictures and notes, I do hope that through these posts pique the interests of the readers into realizing the unappreciated beauty of roaches. It’s certainly been an unforgettable experience, from doing night hikes, walking 13.275 miles, collecting roaches, doing experiments, giving lectures, and just being aspiring TFBs (tropical field biologists). I wonder if things will change as we transition to the ocean portion of this course! Stay tuned for more to come!